Russell Finex is delighted to have been named 2018 Responsible Business Champions for the Feltham and Heston constituency. The award reflects another year of successful growth for the company whilst remaining responsible and ethical in its business practices. From ensuring the quality and consistency of everyday products to reducing the company's carbon footprint and supporting communities around the world, Russell Finex recognizes its duty as an ambitious and successful business to be a positive global citizen and affect change. The All-Party Corporate Responsibility Group (APCRG) launched the Responsible Business Champions Scheme in 2015. The initiative invites MPs from across the UK to nominate an outstanding local business which has had a positive impact in their local constituency. Factors are considered such as the company's overall impact in its community, support for the company's work from local partners and suppliers, and the extent to which it goes beyond what the company is obliged to do in acknowledging corporate social responsibility. MPs are sent certificates by the APCRG to present locally to their Constituency Responsible Business Champion. 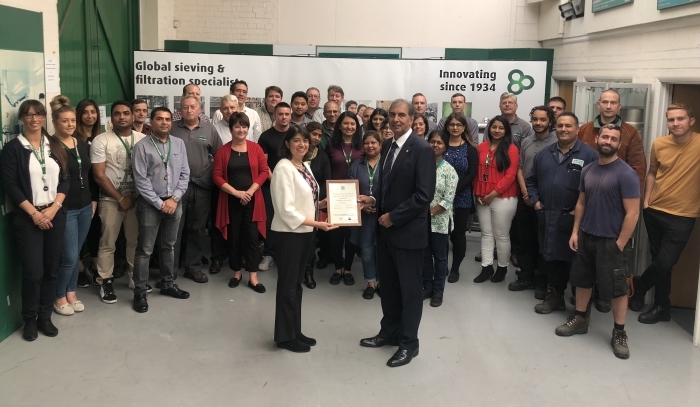 Seema Malhotra, MP for Feltham and Heston, visited Russell Finex's Feltham headquarters in September to present the certificate. Mrs Malhotra commented, "It gives me great pleasure to return to Russell Finex and present this award. I am always proud to visit Russell Finex and show recognition to a highly-valued local business. The company has shown great ambition to continue prospering in challenging economic times and has supported the local community in a number of ways including our recent Hounslow's Promise mentoring initiative." Ray Singh, Russell Finex Managing Director, was delighted to receive the award. "At Russell Finex, we remain aware of our responsibility as a leading business, both in the UK and overseas. We believe that high standards of social and environmental behavior in our business are essential to achieve both financial and non-financial goals. Our high standards are applied to all areas of our business, as we endeavor to achieve sustainable development, economic efficiency, health and safety and social and environmental responsibility." The award provides another highlight in a successful year for the company, having also won several industry awards and local business awards, as well as being published in the 2017-18 Parliamentary Review as a leading example of outstanding manufacturing practice.